I began blogging with my students in 2008. Back then it was a ‘fun’ experiment and little did I know how many benefits and rich experiences would evolve. I’ve elaborated about my blogging journey in this post on The Edublogger. 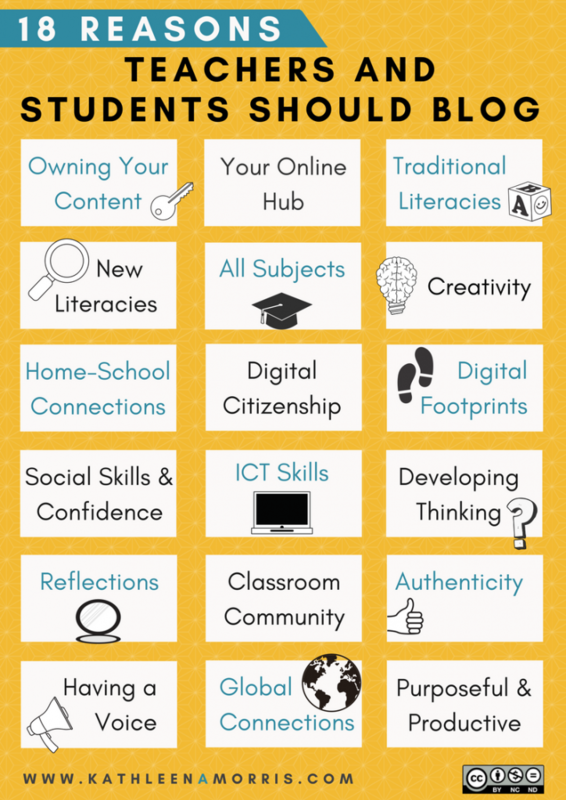 Blogging is a fantastic way to strengthen the connections between home, school, and the world. The amount of learning that can happen through blogging is priceless. I believe the future of blogging is bright, as I elaborated on in my post: Are Blogs Dead? 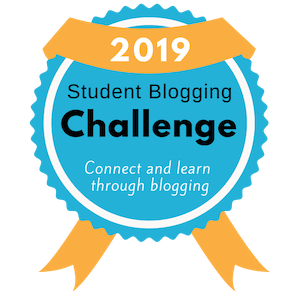 What are the benefits of blogging for teachers and students? Read about the reasons why teachers and students should blog in my post on the benefit of blogging. It includes the poster below which you’re welcome to use. Want to start a blog? What platform should you use? There are lots of places you can create a blog. Some are simple ‘drag and drop’ platforms but the pros rarely use these: anyone who is serious about blogging generally hosts their own blog using WordPress.org. WordPress powers over one-third(!) of the whole web and is a great choice for any blogger — beginner or advanced. I have written an article about the benefits of WordPress in education if you want to know more. If you like the idea of using WordPress but don’t like the idea of hosting your own blog, there are options. I’ve been a fan of Edublogs for 10+ years because it’s based on WordPress, is customised for education, and you don’t have to worry about all the backend hosting and technical side of things. If you’re a teacher in a government or Catholic school in Victoria, Australia, I definitely recommend setting up your class/teacher and/or student blogs on Global2. This is a free premium service powered by CampusPress — Edublogs sister service. I have used Global2 myself since 2008 and have found it to be excellent. 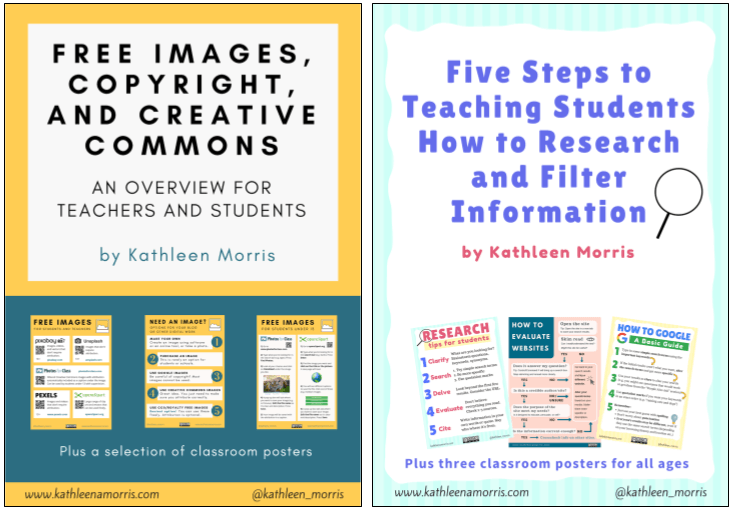 I’ve written a lot about educational blogging over the years! I’ve included just a small selection of articles below. If you’re looking for something in particular, leave a comment or contact me and I might be able to help you locate it. For more information about educational blogging visit The Edublogger. This site has been a wealth of information for me for many years, and I am now a contributor! Thank you so much for kindly sharing your wealth of knowledge with us all. I have found your site incredibly helpful. Hi Karen, so glad you find it useful! Enjoy blogging! I’m starting a class blog with my year 2 class this year. This is my first to have a class blog. Your website is just wonderful. 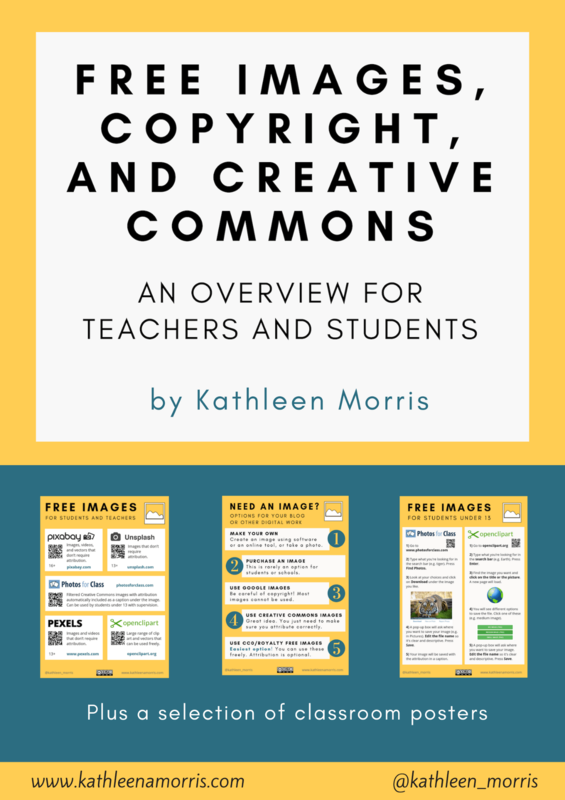 It’s full of information for people like me who are starting a class blog for the first time. I was just wandering if I could use/borrow your blogging information note to give to the parents in my class? Thank you for sharing your knowledge and experience with all of us! Go ahead and good luck with blogging this year! I’m sure your kids will get a lot out of it. I was wondering what is the easiest way to add videos to blogs. Are there any programs you would recommend? We have tried Vimeo and uploading to YouTube but we would like something more simple that the students could use easily themselves. We would like the videos to be viewable on pcs as well as iPads. By the way, you have provided inspiration to many teachers at our school. We have introduced blogging this year and the information you supply on your blog has been a great support for staff. Thank you on behalf of all at St Peters Hoppers Crossing. Unfortunately I don’t have a great answer for your video question. I have found the best program to be SchoolTube which I have written a review of here http://www.teachgennow.com.au/2011/07/41-schooltube/ Children can upload their own videos, however, mine don’t. I use Vimeo and YouTube from time to time too. SchoolTube, Vimeo and YouTube should all be viewable on iDevices. Are you on Twitter? If not, that is an amazing place to ask the education community questions. Someone might have a better answer than me? My name is Kelly, I am a 1st year Early Childhood and Primary Education student at Australian Catholic University in Brisbane. I am currently doing some research for a tutorial presentation on parent/teacher partnerships. I was looking into blogs as a method of communication and stumbled upon your blog. I love it! My daughter is in year 2 and I would love this to be used in her school – from a parents point of view I think it is awesome, however from a pre-service teachers point of view I think it would be an invaluable aid in maintaining partnerships with parents. I was wondering if you would mind if I included a link on my power point presentation to your class blog so that I can show my fellow class mates an example of an awesome blog? I would be shown to approx. 30 fellow students and my lecturer only. Would you mind if I did this? That’s fine! My blog is open for anyone to look at. Thanks so much for your kind words and good luck with your presentation! My name is Teresa and I am a 3rd year, per-service teacher at the University of Southern Qld. I am currently enrolled in EDC3100-ICT and pedagogy. For this course I am to design a digital artifact discussing the impact of ICTs in the classroom environment. I have chosen to research blogging. I would love to use your class blog as a screen shot in my assignment, as well as discussing how you integrate blogging into your classroom learning. May I have your permission to include your blog in my assignment please? I look forward to hearing from you soon. Thank you for sharing your knowledge and use of blogging with us. That’s fine. Good luck with your assignment! I’ve been following your blogging journey for awhile now, both on your teacher blog and your Yr 2 and Yr 4 classroom blogs. What you are doing is so inspiring and I have finally taken the leap this year to start a classroom blog with my students. I am essentially piloting the concept for my school and have found all your ideas, documents and posts SO helpful. I know on your classroom blog you say that people are welcome to your parent notes, guidelines etc as long as they attribute – I have done so but just wanted to also say a huge thank you. I have used your exemplary blog to convince my school of how worthwhile blogging is, and to give the parents at school an idea of what a blog can look like and the numerous benefits. I have already received some permission notes back from parents, I’ll be running a short info session to answer questions and my kids are getting really excited. Thank you for inspiring me in this journey! Great to hear from you and thanks for your kind words. I’m really happy to hear you’ve started blogging with your students and you’ve found the parent notes etc useful. Good luck with your blogging journey. I love your enthusiasm! The information you have about blogging is fantastic. I’ve recently started a class blog with my year 3/4 class. I’m learning as I go along and refer to your webpage when I need a hand. Just wondering if you will have some sort of Professional Development over the holidays or even a chance to chat to see if I’m heading in the right direction? Thanks so much for your comment and I’m so happy to hear you’ve started blogging. I would love to run a PD or something but I’m heading off for maternity leave soon as I’m expecting a baby in July. Sorry I can’t help this time! I had not considered starting a classroom blog for my fifth grade class until I read your blog. Thank you for sharing. wow! great news for every student. Thanks for share. this is an amazing work .The depth of information here is very impressive you outdid yourself..I read each ans every word of your blog..its superinformative. Thanks for helping all I can definitely say this information has been very helpful..